All about the best team in the land and all the world Manchester City!!! 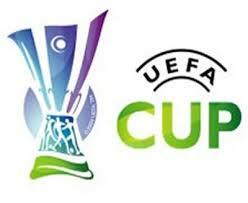 : Uefa Cup draw sends City back to Germany!!! City have drawn Hamburger SV in the quarter finals of the Uefa Cup, the first leg of the tie is away. If we get through that tie and go on to the semi finals we will play the winner from the Werder Bremen vs Udinese Calcio game, the first leg of that tie would also be away. The quarter final first leg ties are set to take place on the 9Th of April, with the return leg scheduled for the 16Th of April. The semi final first leg ties are set to take place on the 30Th of April, with the return leg scheduled for the 7Th of May. The Final is set to take place on the 20Th of May. We got a tough draw that's for sure, I am not worried though I think when we are on our game we are at the very least as good as the teams we have been drawn against. We are also away in the first legs of the quarter final and the semi final(if we get through), I think that is a good thing because whatever happens in the away leg we will know what we have to do to win the tie by the time the second leg comes around and in that situation home advantage is a big plus.